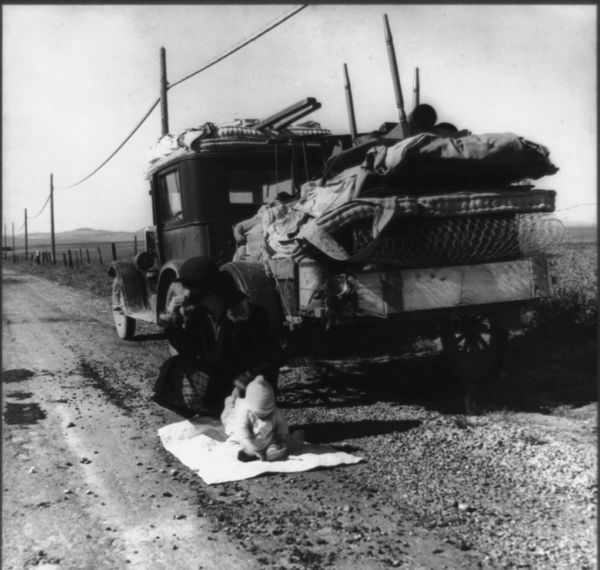 Dust Bowl refugees - with Climate Change, there's nowhere left to run to. The Senate Environment Committee met today, their first meeting after “Super Storm Sandy” struck. Silly me, I was expecting some kind of opening statement by the Chairman and a pledge to finally recognize the significance of the storm as another “extreme weather event” that will force real change in energy, transportation, and coastal land use management policies. I figured the Chair would clear the deck: table all the bills previously scheduled and dedicate the session to an adult conversation (or at least mention and brief the public on the plan for Senate President Sweeney’s public hearings). I was wrong – there was no epiphany, no context, no discussion of upcoming shore hearings, and the agenda included bills to subsidize natural gas and diesel vehicles. I had planned to testify briefly and use Ken Burns’ most recent documentary “The Dust Bowl” as metaphor – particularly since PBS ran Part I last night. But, the Chairman stole my thunder, in his introduction of the new Farm Bureau President. In a friendly colloqui, Chairman Smith urged the new Farm Bureau President and others to watch Burns’ documentary, which Smith emphasized was about “the greatest man made environmental disaster in history”. However, it appeared that the new Farm Bureau President and Chairman Smith viewed the Dust bowl as primarily an agricultural problem. But the implications of the Dustbowl have much broader economic, technological, ecological and social root causes and lessons to be learned – there are broad parallels as the Dust Bowl becomes a surprisingly apt metaphor for our current global warming and climate change crisis. Ken Burns’ documentary is based significantly on environmental historian Donald Worster’s classic book, Dust Bowl: The Southern Plains in the 1930’s. The first 15 minutes of the Burns documentary interview Worster and summarize his key observations. But unfortunately, those conclusions were lost in the following 90 minutes, due to the emphasis on the human interest angles on the catastrophe. So let me excerpt the key contours of Worster’s work and let readers draw their own conclusions about the implications for today’s global warming crisis. All progress in capitalistic agriculture is a progress in the art, not only of robbing the laborer, but of robbing the soil. The Dust Bowl was the darkest moment in the 20th century life of the southern plains. The name suggests a place – a region whose borders are as inexact and shifting as a sand dune. But it was also an event of national, even planetary, significance. A widely respected authority on world food problems, George Borgstrom, has ranked the creation of the Dust Bowl as one the three worst ecological blunders in history. The other two are the deforestation of China’s uplands about 3000 B.C., which produced centuries of silting and flooding, and the destruction of Mediterranean vegetation by livestock, which left once fertile lands eroded and impoverished. Unlike either of those events, however, the Dust Bowl took only 50 years to accomplish. It can not be blamed on illiteracy or overpopulation or social disorder. It came about because the culture was operating in precisely the way it was supposed to. Americans blazed their way across a richly endowed continent with a ruthless, devastating efficiency unmatched by any people anywhere. When the white men came to the plains, they talked expansively of “busting” and “breaking” the land. And that is exactly what they did. Some environmental catastrophe’s are nature’s work, others are the slowly accumulating effects of ignorance or poverty. The Dust Bowl, in contrast, was the inevitable outcome of a culture that deliberately, self-consciously, set itself the task of dominating and exploiting the land for all it was worth. The Dust Bowl came into being during the 1930’s, … the age of the Great Depression. Coincidence, some might say, that the two traumas should come at the same time. Few who have written on either affair have noticed any connection between them. My argument, however, is that there was in fact a close link between the Dust Bowl and the Depression – that the same society produced them both, and for similar reasons. Both events revealed fundamental weaknesses in the tradtional culture of America, the one in ecological terms, the other in economic. Both offered a reason, and an opportunity, for substantial reform of that culture. That the thirties were a time of great crisis in American, indeed world, capitalism has long been an obvious fact. The Dust Bowl, I believe, was part of that same crisis. It came about because the expansionary energy of the US had finally encountered a volatile, marginal land, destroying the delicate ecological balance that had evolved there. We speak of farmers and plows on the plains and the damage they did, but the language is inadequate. What brought them to the region was a social system, a set of values, an economic order. There is no word that so fully sums up those elements as “capitalism”. … Capitalism, it is my contention, has been the decisive factor in this nation’s use of nature. To understand that use more fully we must explain how and why the Dust Bowl happened, just as we have analyzed our financial and industrial development in the light of the 1929 stock market crash and the ensuing factory shutdowns. There is no way to attach a neat, simple meaning to a phenomenon as large and changeable as capitalism. Even in the industrial period of the last 200 years it has worn many faces and forms. The words we associate with it are clues to its elusive breadth: private property, business, laissez-faire, profit motive, the pursuit of self-interest, free enterprise, an open marketplace, the bourgeoisie. For Adam Smith it was an economic system loosed from the shackles of feudalism – a “natural liberty” to make, buy, and sell things. For Karl Marx it was a viscious class order in which a few owned the means of production and the rest sold their labor to stay alive. For Max Weber capitalism was a “spirit” that emphasized hard work, accumulation, and economic rationality. America, the nation most thoroughly dominated by business institutions and drives, shows a similar diversity of meaning – a fur trapper going up the Missouri, a railroad executive selling stock, a wheat farmer buying more land, an archetypical factory owner hiring and firing workers. In the 1930’s capitalism in Henry Ford’s automobile empire meant one thing – a pattern of investment and credit, organization of people and resources – but on the Great Plains it meant something slightly different, perhaps more primitive, albeit strongly influenced by Ford’s machines and production methods. Capitalism is, in other words, a complex economic culture. It is a mode of production that is constantly evolving in many particulars and varying from country to country, from region to region, from decade to decade. But it maintains a recognizable identity all the same: a core of values and assumptions more permanent than these outer forms – an enduring ethos, we will call it here, that gives the economic culture continuity. The land in this culture, as in any other is perceived and used in certain, approved ways; there are, in other words, ecological values taught by the capitalist ethos. We may sum them up in three maxims. 1. Nature must be seen as capital. It is a set of economic assets that can become a source of profit or advantage, a means to make more wealth. Trees, wildlife, minerals, water, and the soil are all commodities that can either be developed or carried as they are to the marketplace. A business culture attaches no other values to nature than this; the non-human world is desanctified and demystified as a consequence. Its functional interdependencies are also discounted in the economic calculus. 2. Man has a right, even an obligation, to use this capital for constant self advancement. Capitalism is an intensely maximizing culture, always seeking to get more out of the natural resources of the world than it did yesterday. The highest economic rewards go to those who have done the most to extract from nature all it can yield. Private acquisitiveness and accumulation are unlimited ideals, impossible to satisfy once and for all. … There may be many reasons why people misuse their land. But the American Dust Bowl of the thirties suggests that a capitalist-based society has a greater resource hunger than others, greater eagerness to take risks, and less capacity for restraint. The implications of this should be obvious, though it is not my intention here to spell out detailed remedies or even dwell at length on the contemporary situation. Many have assumed that the New Deal found a sufficient cure for the excesses of free enterprise. From a ecological point of view that confidence seems grossly misplaced, if the evidence of the last several decades counts for anything. American is still, at heart, a business-oriented society; its farming has evolved even further toward the Henry Ford example of using machinery and mass production to make more and more profits. We are still naively sure that science and technique will heal the wounds and sores we leave on the earth, when in fact those wounds are more numerous and more malignant than ever. Perhaps we will never be at perfect peace with the natural order of this continent, perhaps we would not be interesting if we were. But we could give it a better try.